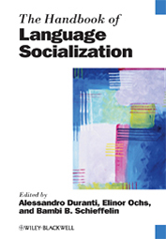 Editor/Author Duranti, Alessandro, Ochs, Elinor and Schieffelin, Bambi B.
Documenting how in the course of acquiring language children become speakers and members of communities, The Handbook of Language Socialization is a unique reference work for an emerging and fast-moving field. Spans the fields of anthropology, education, applied linguistics, and human development. Includes the latest developments in second and heritage language socialization, and literary and media socialization. Discusses socialization across the entire life span and across institutional settings, including families, schools, work places, and churches. Explores data from a multitude of cultures from around the world.